The unsettling saga of Larry Flynt's most notorious protegè. In May 1989, Dwaine Tinsley stood at the summit of an unlikely career. The product of a broken, trailer-trash marriage, he was a high school dropout who had decided to become a professional cartoonist while serving a six-year sentence in a Maryland prison for burglary. As cartoon editor for Larry Flynt's notorious Hustler magazine, he had assembled a staff of pen-and-Wite-Out-wielding Lenny Bruces whose unprecedentedly offensive socio-sexual cartoons had spearheaded that publication's fight against the forces of censorship and repression that sought to overthrow the political and cultural gains of the 1960s. His primary personal contribution—spawned amidst a national hysteria that saw a plague of child sexual abuse arising everywhere from pre-school staffs to satanic sects—was "Chester the Molester," a hulking middle-aged man who craved pre-pubescent girls. And then Tinsley's teenage daughter accused him of sexually violating her over the course of five years. And the prosecution in his ensuing criminal trial cast several storage boxes full of his cartoons against him. 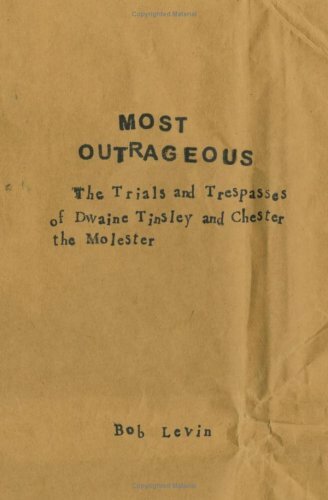 Most Outrageous is the story of the trial of Dwaine Tinsley as well as the story of Tinsley's family life. Bob Levin's writings have established him as one of the most thought-provoking chroniclers of cartoonists today. While focusing upon the work and lives of the most offbeat creators in the field in order to champion the pursuit of individual vision, no matter how unorthodox or inflammatory, he has explored issues common to artists of every medium. Most Outrageous carries his search onto new, unsettling ground. If you have any questions about this product by Fantagraphics Books, contact us by completing and submitting the form below. If you are looking for a specif part number, please include it with your message.